The American Academy of Actuaries, the public face of a behind-the-scenes profession, is in disarray after quietly sacking its incoming president, then trying to conceal both his ouster and an unpleasant secret from his past. The president-elect, Bruce Schobel, is one of America’s foremost authorities on the Social Security system. He is also a onetime convicted felon who, according to court records, served time three decades ago for “assault with a dangerous weapon while demanding property” in New Jersey. Few know this, though, because his record has been expunged. Mr. Schobel has put many productive years between himself and his conviction. The matter would probably be entirely unknown if it had not surfaced in the profession’s long-running debate about actuarial accountability, and the way numbers bearing little resemblance to reality keep turning up at the scene of failed insurance companies, collapsed pension funds and states that cannot balance their budgets. Such scenes are embarrassing to actuaries, who consider themselves crack risk-management experts, toiling in obscurity to keep insurance companies solvent and pensions funded. Like doctors, they are generally reluctant to point fingers in public or accuse a colleague of malpractice. The profession, decentralized and largely unregulated, relies on public trust, and no one wants to undermine that trust. 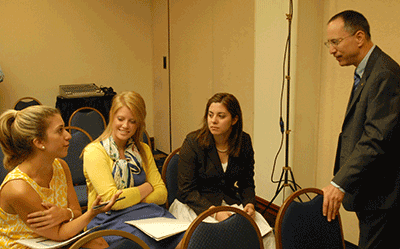 So when controversy flares, there are panels, discussions, resolutions — but often little change. Mr. Schobel has been among those trying to modernize the profession, raising its profile in Washington and its credibility with the public. Now, though, he is turning into one of the problems it has so much difficulty solving. A spokesman for the academy said he could not comment on any aspect of Mr. Schobel’s ouster. Mr. Schobel, in response to questions, offered documents contending that his removal was illegal and letters he had received from both his sympathizers and his detractors. He said his opponents had tried to use unflattering and irrelevant information to blackmail him. Several of his supporters cited a New Jersey law making it illegal in that state to reveal the existence of an expunged criminal record. It was Mr. Schobel, however, who revealed his criminal record, in open court in Cook County, Ill., two years ago. He argued then, in a different lawsuit, that his crimes were “high misdemeanors,” not felonies, but the court disagreed and found that “felony” was the correct term. He was also convicted on a charge of “atrocious assault and battery” in that same episode. The academy’s current troubles began in June, when 19 of its former presidents — nearly all of its former presidents living today — sent a letter to its board, saying that the public expected an “exceptionally high level of integrity” in actuaries, and expressing grave doubts about Mr. Schobel’s suitability as president. The board met in early August, and the majority voted to remove Mr. Schobel. This was unprecedented — and yet no one broke the news to the membership. Only about three weeks later did the academy post a bland notice on its Web site, saying it would fill “the vacancy in the office of the president-elect,” without mentioning Mr. Schobel or explaining why there was a vacancy. That started an uproar. Angry and incredulous actuaries have besieged the academy, quoting from the Declaration of Independence, calling the board “drunk with power,” and demanding to know what had happened to Mr. Schobel. Some pointed out the academy’s weak governance structures and proposed a coup of sorts. This month, Mr. Schobel sued the academy, saying it had defamed him and removed him illegally, after being intimidated by “a cabal of individuals who disagree” with his “vision for the academy, and his personal style.” The lawsuit, filed in United States District Court for the District of Columbia, seeks Mr. Schobel’s reinstatement, and $2 million in damages for defamation and harm to his client relationships. The academy has filed a response saying its board’s actions were legal and appropriate. It did not mention the felony conviction either, but attached further documentation under seal. As it happens, the documentation is not sealed in the court in Cook County, where the academy is incorporated. There, Mr. Schobel was sued in his capacity as president of a sister group, the Society of Actuaries, in 2007. The suit was filed by Sarah Sanford, who had been fired as executive director of the society and who accused Mr. Schobel of defaming her. In her complaint, she mentioned the long-running actuarial debate about accountability, adding that she had clashed with Mr. Schobel over whether convicted felons should be barred from the profession. She said she had supported such a ban, but Mr. Schobel had opposed it, saying felons should be barred only if their crimes were related to financial services. 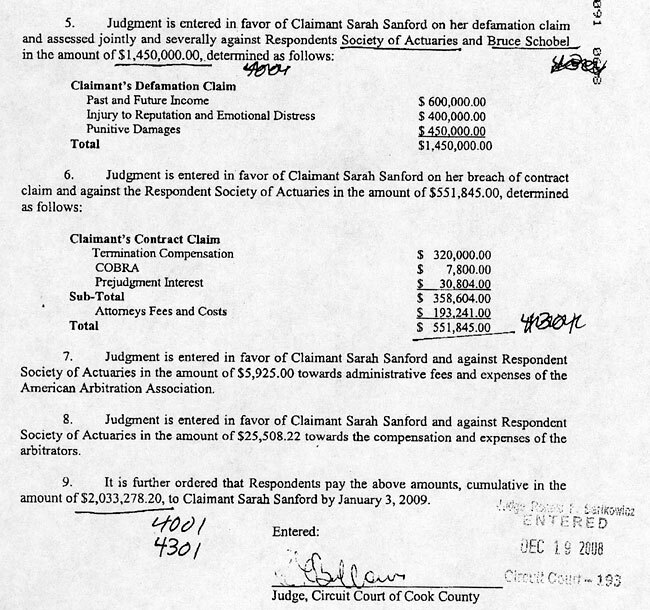 Reached this week in Illinois, Ms. Sanford said she had nothing to say beyond the existing court records in the case. A year and a half of messy litigation followed, in which Mr. Schobel countersued, accusing Ms. Sanford of defaming him by sending e-mail messages under a fake name, telling other actuaries about his old felony conviction. In the end, an arbitration panel found that Mr. Schobel had been unable to provide any evidence to support his claims that Ms. Sanford “looted” the society — or that she sent defamatory messages about him. The society, a co-defendant with Mr. Schobel, had to pay an award and court costs of a little more than $2 million. Mr. Schobel tried to have the records sealed, but a Cook County circuit judge refused, on the grounds that Ms. Sanford had been harmed and had the right to clear her name. By that time, though, Mr. Schobel had become the president-elect of the American Academy of Actuaries, having been nominated and affirmed by its board. The board of the academy, based in Washington, was unaware of the legal debacle at the society, which is in Schaumberg, Ill., and Mr. Schobel had been the only nominee for the post. “Defamation of character is unprofessional and does not uphold the honor of the office of president-elect of the American Academy of Actuaries,” one former president, David Hartman, wrote in a message to Mr. Schobel. Mr. Hartman said he could not fathom why Mr. Schobel had not tendered his resignation at once. On Wednesday, a federal judge in Washington is scheduled to hear Mr. Schobel’s request for a court order affirming that he is still president-elect of the academy. While he soldiers on in court, the academy has begun a search for a new president-elect. Whoever does emerge will be seated as president at a full meeting of the academy in Boston on Oct. 26. Karen Ann Cullotta contributed reporting. 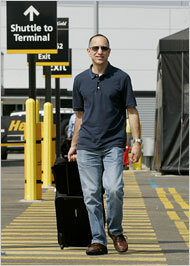 Bruce gets his picture taken by reporters as he's boarding planes? Haha. I'm flabbergasted that they had a file photo of Bruce in Oakland airport (OAKLAND!!) from 2006. (a) Say "Yes, 30 years ago I was convicted of assault. Obviously I regret it. I'm grateful that I've been given the opportunity to rise above that incident and contribute so much to my profession and society. This is one of the reasons I don't want to close the doors of AAA membership to others who have made a mistake in their past, unless there is no choice such as if they committed a financial felony." (b) Try to keep the employee who knows my secret happy, praising her and working to get her nice raises so she will be hesitant to do me harm. (c) Spread malicious lies about her to get her fired, so she has strong motivation to destroy my reputation and nothing further to lose by doing so. I would like to believe Bruce would choose (a), but if not, could he really be stupid enough to choose (c) instead of (b)? I don't buy it. How right you are. Sanford told me in 2002 that she knew about an expunged conviction. She was fired in 2006. No connection whatsoever. Not stupid enough, certainly. How about mad enough? How about someone who can get mad enough to lose self control? Have you heard the Anderson story? In his defense, however, maybe the beginning of c should read "Spread malicious truths .."